Well, friends, it’s time to start prepping for my next time away. This time will be the longest I have ever been away from the kids or Papa Bear since I met him 15 years ago. That looks like a bigger number than it feels like when you say it. Yep, 15 years ago. I am going to be gone a staggering two whole weeks this time, so Papa Bear is already in dreading it mode. I have started cooking double batches of dishes – one for dinner and one for the freezer so that it won’t be so taxing to prepare food for them. In the midst of that, we have art camp, a one week family road trip (eeeekkkk!) a 10th birthday party to plan and a tiny bit more summer to scratch out. It is going to be a busy few weeks before the plane lifts off. This week, I’m making Taco Pies. These are easy, simple, can be made with clean ingredients if you don’t want to use taco seasoning (I guess that makes me a dirty, dirty girl? 😊 ). I am opting for a simple recipe that freezes well, as is the basis of all of my freezer meals for when I am gone. I like to use the heat and eat philosophy so that Papa Bear’s life is at least a little more simple than it would be with more complex recipes. I just hope the kids don’t have 15 days of Spaghetti O’s. 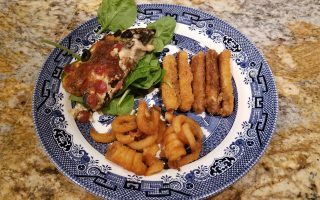 I made this for dinner last night and the kids went through it like beavers at a sweet water pond! Of course, they tried to eat around the tomato, but I was still able to sneak some salad in on them. To prepare, brown and season one pound of ground beef as if you were going to make tacos. Drain it and set it aside. Put both of your thawed frozen shells on a cookie sheet. Open your can of refried beans and spoon ½ of the can into each pie crust bottom. This is going to be your first layer. Spread it out into an even layer, then do the same with the ground beef. 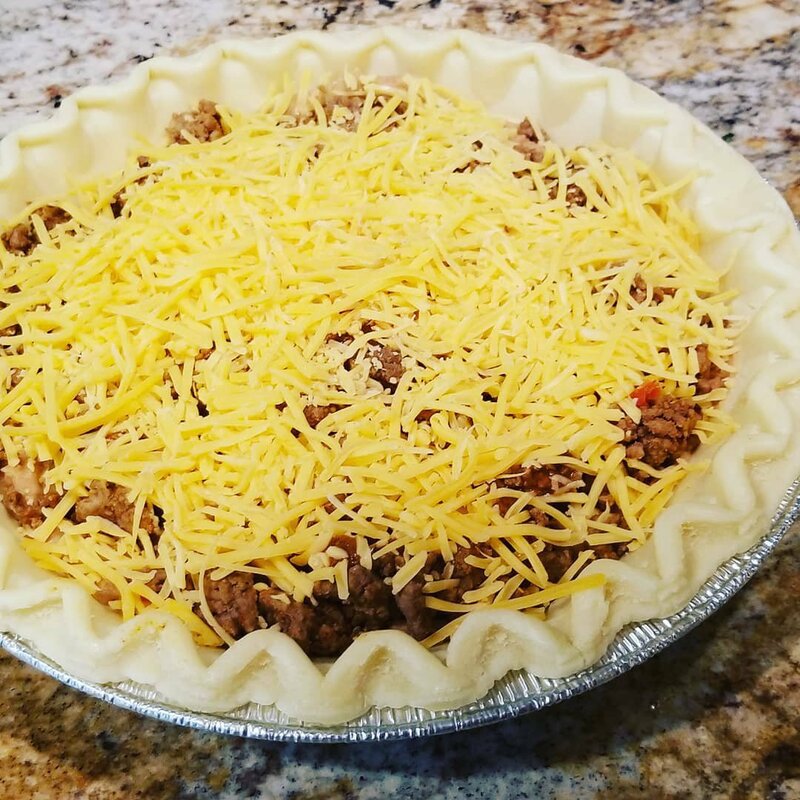 Using ¼ of your bottle of taco sauce, make a spiral of sauce, starting at the center and moving to the edges on top of the ground beef – repeat on the second pie. Make sure you still have ½ of your bottle left to use on the top of the pies. Sprinkle with a layer of cheese – ¼ of your bag on each pie and spread evenly. Follow the directions on your pie crusts and bake until the crusts are done. Once done, remove the pies from the oven and let them cool a bit. Top with a layer of lettuce, freshly diced Roma tomatoes, and red onion if you like (I like, the children act like I am attempting to feed them antifreeze if they can see them). Using your Mexican crema, drizzle thin stripes back and forth across the lettuce and tomato to give each bite a nice creamy, cool hint. Using the remaining half of your taco sauce (1/4 bottle per pie) make the same motions near but not on top of your creama. You want the flavors to combine in your mouth, not get diluted on the pie – not to mention it starts to look like someone sneezed if you mix them up too much. I know, gross, but trust me on this one. I also like to sprinkle sliced black olives on top for garnish. They add such a happy little color contrast to the lettuce and really set off the crema. Luckily, the tinies don’t ever fight me on black olives. Finally, I like to hit it with a tiny bit of minced cilantro for an extra Mexican-y kick. I love the fresh, bright flavor of cilantro, but it isn’t for everyone – use if you want, ditch if you want. All done. I usually serve this with a corn and black bean salad and leave off the Spanish rice since we have a crust on the pie. 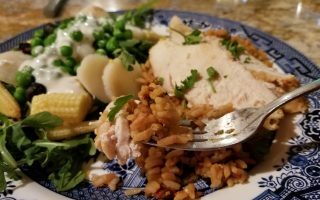 It is a great, low effort summer meal that is a nice change from Taco Tuesday. In my house, we never did a set meal on a set night as a kid. I probably wouldn’t have minded it, but it was never a thing. I don’t do that now either. One thing I do regularly is plan my meals the week or month before so that I can buy bulk ingredients and prep them one weekend a month. I will link you to some of my bulk cooking recipes from the last trip I took here. As I get read for the long trip in July, I’ll start gathering my recipes that are great for freezer cooking and bulk cooking and create a round up for you guys to help you get ready for that lovely back to school season that is officially right around the corner again. Can you believe it? I’m astounded how quickly the summer is getting away from us! Enjoy the taco pie and let me know what little add ins you use – drop me a photo of your results! Buen provecho (confession – I secretly love that my spell check wants to turn that into prosecco every time)! Next ArticleFerdinand Theme Night – Spanish Food Lovers, Take Heed – YUM!